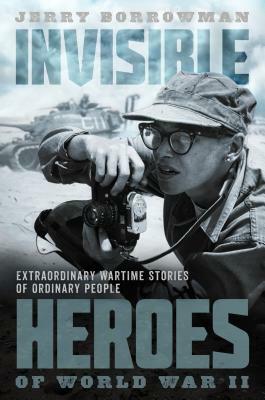 Invisible Heroes of World War II documents ten fascinating true stories of a diverse group of soldiers and noncombatants from all over the world, including African Americans, women, and Native Americans, who fought with the Allies during World War II. These heroes made significant contributions in the war effort, and sometimes gave their lives for freedom and liberty, often without much recognition or fanfare. Some were frontline soldiers who were captured by the enemy and endured horrific conditions as POWs, others were ordinary citizens who fought in the French Resistance and provided vital operations to undermine Nazi occupation, while others were engineers, workers in industry, or war correspondents and photographers. All served with valor and distinction as part of the massive Allied forces who fought to free the world from tyranny and oppression. Jerry Borrowman is an award-winning author of historical fiction and nonfiction. He has written about the World Wars, the Great Depression, and the Vietnam War. His book, Compassionate Soldier, was the recipient of the George Washington National Medal of Freedom Foundation at Valley Forge and the Best Indies Book of the Year 2017 Gold Winner for War and Military. He and his wife, Marcella, raised four children and live in the Rocky Mountains.